Politics is King: Please make the oil spill go away! Every news channel has been covering the oil spill in the Gulf of Mexico, with a live stream from the bottom of the Gulf showing the oil seeping out of the broken pipes. The blame game in Washington has started, with President Obama holding a press conference on Thursday to address his administration's handling of the crisis. Meanwhile, Secretaries Hillary Clinton and Timothy Geithner headed overseas to discuss the ongoing situation on the Korean peninsula. 5. Meet "Little Obama" – *spoiler alert* – 'Barry' grows up to be the President of the United States. New York (CNN) - Former President Bill Clinton was in "good spirits" Thursday after undergoing a procedure to insert two stents into one of his coronary arteries, his office said. Clinton was hospitalized at the Columbia Campus of New York-Presbyterian Hospital after experiencing chest pain, according to Douglas Band, counselor to the former president. Despite other media reports that he had left the hospital, Clinton remained there Thursday evening, a spokesman for the hospital said. The "vast right-wing conspiracy" that attacked him during his presidency has been weakened, but continues to operate against President Obama, former President Clinton said Sunday. On NBC's "Meet the Press," Clinton was asked about the term his wife Hillary Clinton, now secretary of state, famously coined. "Is it still there?" host David Gregory asked. "Oh, you bet. Sure it is. It's not as strong as it was, because America's changed demographically, but it's as virulent as it was," the former president replied. "I mean, they're saying things about him [Obama] - you know, it's like when they accused me of murder and all that stuff they did," Clinton said, in an apparent reference to conspiracy theories surrounding the suicide of White House deputy counsel Vince Foster. "It's not really good for the Republicans and the country, what's going on now," Clinton said. "I mean, they may be hurting President Obama. They can take his numbers down, they can run his opposition up. But fundamentally, he and his team have a positive agenda for America." The nation needs "a credible debate about what's the right balance between continuing to expand the economy through stimulus and beginning to move back to fiscal balance," Clinton said. "We need a credible debate about what's the best way to get to universal [health care] coverage." While some criticism targeting President Obama is racially motivated, the fight over health care isn't, former President Bill Clinton said on LKL last night. On the Arab-Israeli conflict - which Clinton tried to address during his time in the White House - the former president said it's an issue that first has to be addressed by the Palestinians and the Israelis. Obama has set up meetings with leaders from both sides this week as the U.N. General Assembly meets in New York. "First, it's more up to them than it is to President Obama," Clinton said. 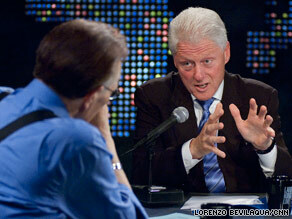 Larry King Live Tonight: Bill Clinton for the Hour! A Primetime Exclusive! 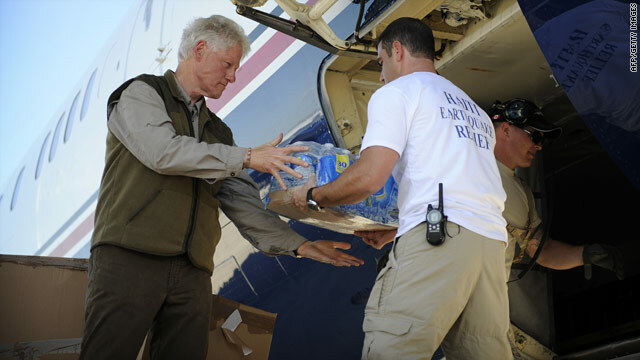 Tune in tonight at 9pmET/6pmPT for a special hour with former President Bill Clinton. We'll talk about the war in Afghanistan, health care reform, and whether racism is really behind some of the attacks against President Barack Obama. 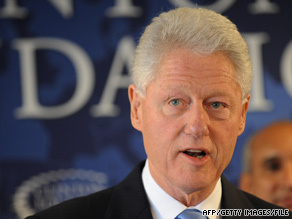 We'll also get an update from the former President on the Clinton Global Initiative and its impact around the world. You won't want to miss it! That's all tonight at 9pmET/6pmPT. 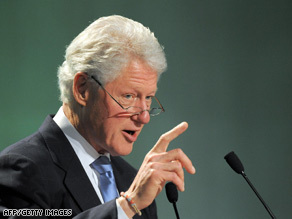 What would you like Larry to ask former President Bill Clinton? Former U.S. President Bill Clinton landed in North Korea early Tuesday on a mission to negotiate the release of two American journalists imprisoned there since March, according to the country's state news agency and a CNN source. The North Korean news agency KCNA did not disclose the purpose of the visit in its three-line dispatch. But a source with detailed knowledge of the former president's movements told CNN late Monday that Clinton was going to seek the release of Laura Ling and Euna Lee, both reporters for California-based Current TV - media venture launched by Clinton's former vice president, Al Gore. Meeting Clinton were the vice president of North Korea's Supreme People's Assembly, Yang Hyong Sop, and Kim Kye Gwan, the vice foreign minister, KCNA reported, adding that "a little girl presented a bouquet to Bill Clinton." Sunday's LKL: Pres. Bill Clinton and Sanjay Gupta! Tonight, CNN's Chief Medical Correspondent, Dr. Sanjay Gupta fills in for Larry and his first guest is former President Bill Clinton! His administration tried to revamp America's healthcare, but failed. What does he make of President Obama's plan? He'll talk to Sanjay about that and more. Then, an exclusive with Christopher Reeve's daughter! Alexandra Reeve speaks out on President Obama's order for an increase in government funding of stem cell research. What does she think of the decision her father fought so hard for? It's all tonight as Sanjay Gupta guest-hosts on Sunday's "Larry King Live," at 9 p.m., ET. Larry returns to the desk Monday and he'll be joined by Judge Judy! She never disappoints! Leave your comments or questions for Judge Judy Sheindlin HERE! Then, tune-in Monday night for the live show. We just may use your comments on the air during our Blog Segment. ICYMI: Bill Clinton on LKL last night! Former President Bill Clinton was on LKL last night – he spoke to our guest host, Sanjay Gupta, about the new administration's efforts to achieve healthcare reform, and also discussed his own health. CLINTON: Sometimes it shakes. See it's a little shake, no shake here. I've been tested for it. I don't have Parkinson's. CLINTON: The doctor told me as people age, they become more vulnerable, for example, to having these muscles. Like if I write a lot. CLINTON: Or play video games or, you know, just do anything like that, anything with a lot of my fingers, and these tighten up, or if I'm tired, if I'm working hard, it will cause your hands to shake. So see that's pretty calm today, a little bit of shake, none over here. And some days they both shake, some days none of them do. And I was quite concerned about it, because if I had Parkinson's, I wanted to know, so I could prepare. I had it tested and the doctor says, no, it's just a normal aging phenomenon.